Giffard House: Presbytery and Chapel. 1727-9. By F. Smith of Warwick for Catholic church but in name of P. Giffard. The house contains the earliest remaining post-Reformation public urban chapel for Catholics, now forming the sanctuary of the church, and was the home of Bishop Milner, from 1804 until his death in 1826, an important figure in the Catholic church of the early C19 who had an important role in the passing of the Catholic Emancipation Act of 1829; he left money for the building of the church, which became his memorial and burial place. St. Peter and St. Paul: Formerly known as Catholic Church of St. Mary and St. John. Catholic Church. Nave, 1826-28, by J. Ireland. South chapel and sacristy, 1901 by E. Goldie. North chapel, c.1920. Greek revival style, influenced by J. Soane. An important early post-Reformation Catholic church with connections with Bishop Milner, who .. is buried in the crypt. The interior is one of Ireland's best works. 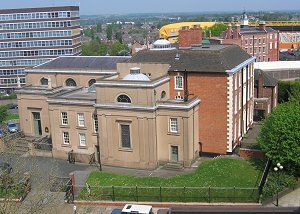 Literature: Pevsner, p.319; Roper's Buildings of Wolverhampton; M. Rowlands, Wolverhampton Millennium: the Catholic Aspect, 1985. 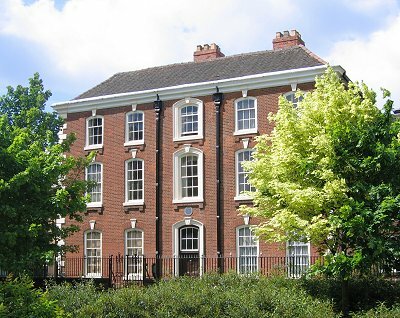 Comment: This building is one of the most important in Wolverhampton, its importance being not just local but national. It is not just about architecture but about religion, tolerance and intolerance. Catholicism was strong round here and never got suppressed after the Reformation. The story of King Charles running round this area in the civil war is largely a story about Catholicism. Many of the important local landowners were Catholics, including the Giffards. In the early 1700s they decided to make provision for local Catholics to worship in public. That was illegal, but private Catholic chapels were not. So Giffard built himself what purported to be a town house but the rear part of the ground floor was given over to a large private chapel - large enough for any local Catholics who wished to attend. The building on the left is Goldie's south chapel of 1901 but it follows the lines of the original. The photo gives you some idea of how the new church was built onto the back and into the back of Giffard House. Everyone round here knew what was going on; but nobody said or did anything. Wolverhampton got an early start in religious toleration. The chapel was so big that there was not enough room for the usual grand staircase, and inside the front door of Giffard House you will find the staircase zig-zagging up the wall in front of you. The bedrooms were over the chapel. Bishop Milner was in the vanguard in the fight for Catholic Emancipation; the campaign was largely co-ordinated and driven from here. When it succeeded a proper church became possible. Ireland was engaged to build one - of the most proper and respectable sort - and incorporating the now historic chapel. Seen from the other end, Ireland's church is on the left (with good statutes of St. Peter and St. Paul over the doorway); Goldie's extension is to the right. Top centre is the back of Giffard House. Note the dome in its roof, which is the dome to the sanctuary of the church. Off the picture to the left is the remnant of the churchyard burial ground. This photo, taken from the third floor of the Civic Centre, shows how the two listed buildings are really one; and it also shows the buildings relationship to the Molineux Hotel, just above it and to the right. The chapel is now the sanctuary of the church (and still has the bedrooms of Giffard House over it) and the aisle is within a new block at the back. Goldie's south chapel and the north chapel of c1920 (which can just be seen to the right of Giffard House in the photo above) are extensions of the original chapel. The result is a remarkable piece of architectural history. 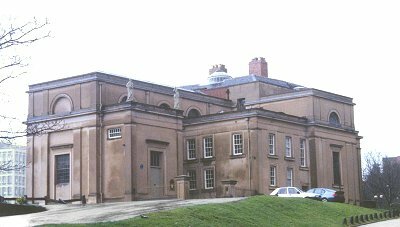 Back at the front of the building, the modern caretaker's house is to the right and at the back is the 1920 north extension of the sanctuary, with three blind arched windows. 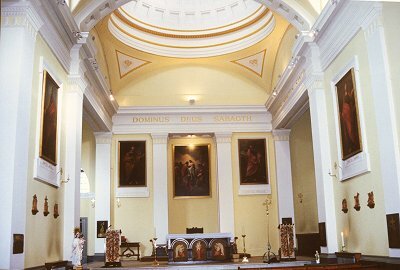 The interior, looking towards the altar. 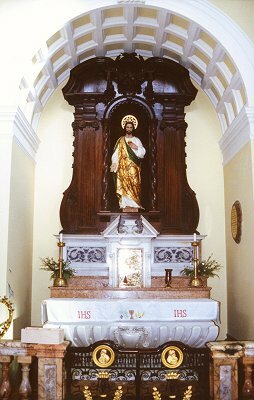 Before the Catholic church's requirements on the placing of altars changed, there was an elaborate altar against the far wall, which has now been placed in a large arched niche just left of the photo. The altar rails were also removed and re-used in various parts of the church. 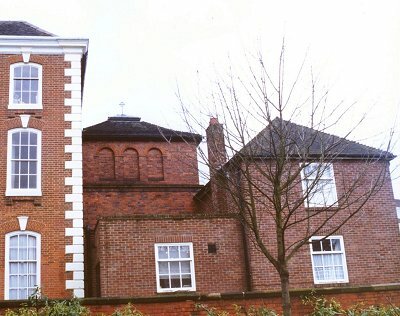 The 1920s extension to the sanctuary (to the left) contains windows with re-used glass, the origins and date of which are unknown; they look Victorian but may just be medieval. This remarkable altar forms a chapel in the Goldie extension of the sanctuary. Its history and origin seem to be unknown. 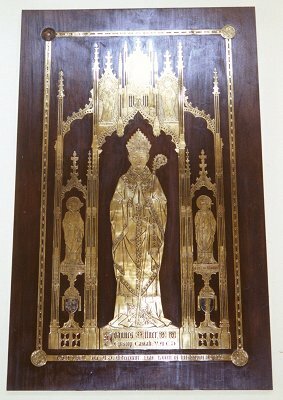 The large memorial brass to Bishop Milner, on the south wall of the aisle. 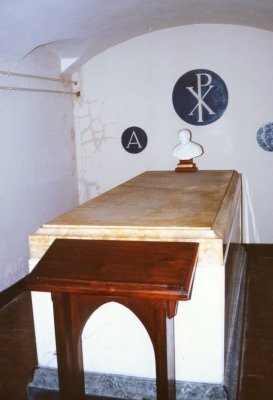 Bishop Milner's tomb in the crypt of the church. The gates and railings to the front of Giffard House appear to be part of the original building. Some ten to fifteen years ago it was proposed to pull the whole lot down. It was in a very derelict state and was felt to be of limited usefulness, being built in a far corner of its parish and separated from it by the Ring Road. A public inquiry was lost and a new bishop resolved to restore it. 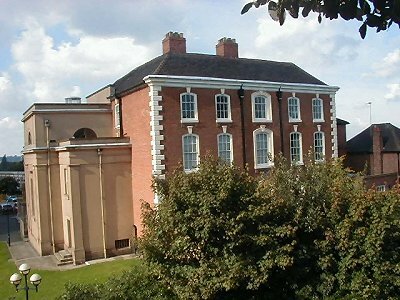 All parts of the building were restored, at the cost of more than £1,000,000, by the Catholic church. The restoration work was very thoroughly researched and excellently carried out. Giffard House and St. Peter and St. Paul's church, inside and out, and the exterior and (perhaps especially) the interior of the church, are very fine architecture, and the building is of exceptional interest in the religious history of this country. The church contains glass, brasses, pictures and other items of great interest. But the Department of State (and what it is called changes so often that I cannot keep up with it) and their "agency", English Heritage, only upgraded it to II* at the last review. This may be because they treat it as two buildings (although it is clearly one) or because they still suffer from the Victorian approach to old buildings and think that to be good it must be very big and very elaborate (or in London?). Many thanks to the parish priest, Father Daley, for permission to enter and take photos.